Until recently, Spanish soccer players weren’t very keen on playing abroad. Exceptions were just a few, like in the sixties, when Luis Suárez (Barcelona) tried his luck with Internazionale Milan, Luis de Sol (Real Madrid) was successful at Juventus and Joaquin Peiro (Atletico Madrid) played for AC Torino, Internazionale Milan and AS Roma. And of course, the Mexican league appealed to lots of players as a final stage with less pressure (among others José Pirri, Juan Manuel Asensi and Emilio Butragueno). Things are different of course when your own country is at war and league soccer has been dissolved. 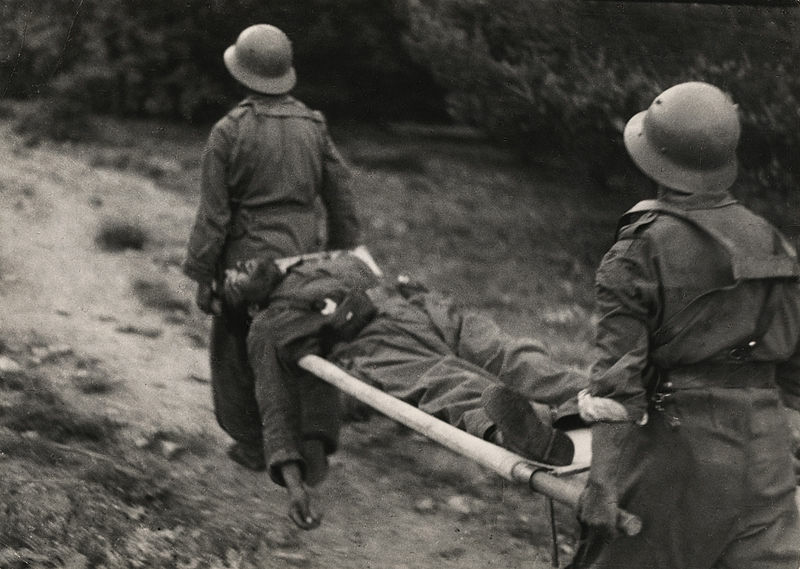 That happened during the Spanish Civil War (1936-1939). At the time, Spain was just starting to become a promising soccer country. They reached the quarterfinal at the 1928 Olympics in Amsterdam and at the 1934 World Cup in Italy. But then fascism stopped that development. For starters, the 1936-37 season couldn’t be played as Spain was divided into two separate parts in the summer of 1936. As it was unclear how long league soccer would be postponed, nothing really happened in the first year. Everybody just waited. Then, in early 1937, the Basque natioanl team (with players from Atletic Bilboa, Real Madrid and others) went on a long tour through Europe and America. Barcelona did the same during the summer of 1937. After their tour, The Basque National Team even took part in the Mexico City-league as Euskadi in 1938-39, claiming second spot behind Asturias. Eventually, most of the players of both teams decided to stay in Mexico or tried their luck in another country, particularly Argentina or France. The Barcelona-team was even stripped down to only four players. The same happened on smaller scale at other Spanish soccer clubs. Here’s a Top 10 of players that did especially well abroad and maneged to win some silverware. As I’m trying to be non-political, this article is only about the soccer life of these players, not about what fascism or politics did to them. But it's no coincidence that most of these players are either Basque or Catalan. Balmanya played at home in Girona in the second division until Barcelona contracted him in 1935. He played 22 matches in his first season. After the Barcelona trip to North America, he moved to French club FC Setè. Winning the championship there in 1938-39 was the highlight of his career. He was big at the club, missing only two league matches that season. He had a teammate in Josep Escola, who came along with him from Barcelona to FC Setè. 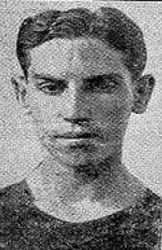 Escola, who was a great goalscorer before in Spain (31 goals in two seasons) knocked in just seven goals that year, and played only 18 matches. After the Civil War, both players returned to Barcelona. Escola (2 caps, 1 goal for Spain) was important for Barcelona for the next eight years, Balmanya not so much. But he did became a successful coach, winning the first ever Inter-Cities Fairs Cup with Barcelona in 1958 and the league with Atletico Madrid in 1966. Santiago Urtizberea already looked back on his brightest soccer moments in 1936. 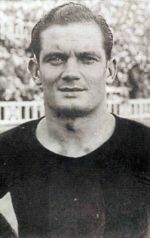 With Real Union Irun and Donostia San Sebastian he spent six good years at the highest level, in which he scored no less than 70 league goals. The two years before 1936 Urtizberea spent in Spain’s second division. Then he chose Girondins Bordeaux as his new club. At the time still amateurs, Urtizberea was vital in them winning the French Amateur title ánd promotion to the second level of professional soccer in France. Further promotion plans failed for two years, although he scored regularly. From 1939 onwards, the Second World War prevented regular league soccer. But Urtizberea singlehandedly gave Bordeaux the French Cup as his two goals gave them a 2-0 victory over Fives in the 1941 final. Two years later, as a player-manager, he couldn’t prevent Bordeaux losing to Olympique Marseille. Padrón was already thirty years old in 1936, with his best years being 1929 until 1931. He was capped five times by Spain, scoring his only two goals for the national team in a 5-0 victory over Portugal. 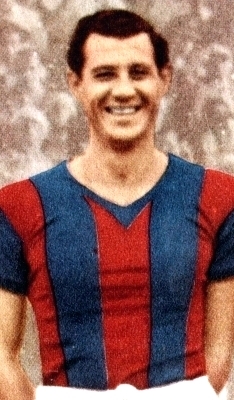 After a good spell with Espanyol, he played one season for Barcelona (1933-34, 7 matches and 2 goals). He is the only Spanish player in this selection who went abroad (France, in his case) before the Spanish Civil War. With Olympique Alès he was relegated in 1936, with AS Cannes he only managed 14th (out of 16 clubs) place. Things fared a lot better at Sochaux, as the team was crowned champions of France in 1937-38. Padrón’s contribution was ten league matches with two goals. Padrón was in the habit of changing clubs all the time, so agian he left for second division club Charleville. After spells at Red Star, Stade de Reims and Clermont-Auverge he hung up his boots at the age of 37. 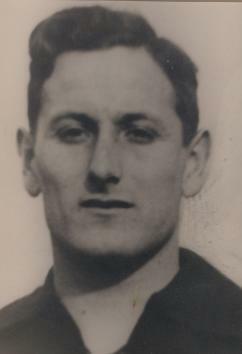 Munlloch, probably still young, played twelve matches for Barcelona in the 1935-36 season. At first, he came back to Spain after the trip with Barcelona to Mexico and the USA, but left in 1938 to play for Mexican club Asturias. Succesfully, as the club won the league in 1938-39. Then he tried his luck in Argentina, with Velez Sarsfield. It didn't work out, as he played only nine matches (one goal) and Velez was relegated. So back he went to Mexico, this time to Atlante where he came very close to winning the 1941-42 championship. Real Espana and Atlante finished on 18 points, and Real Espana won the play-off match 5-4, Munlloch did score one goal in that match. These three brothers from Irun all played abroad after the Spanish Civil War. The eldest, Luis, was transferred from Irun to Real Madrid in 1931, his brother Pedro followed him a year later. Luis had won the title in 1931-32, a year later they won the Spanish titel together. Luis at that time was one of the best scorers in the league (90 goals in eight seasons until 1936), Pedro is a midfielder with hardly any socring skills (one goal in seven seasons). They both represented Spain, with again Luis on top with 25 games and 16 goals. Pedro only managed four caps (no goals). 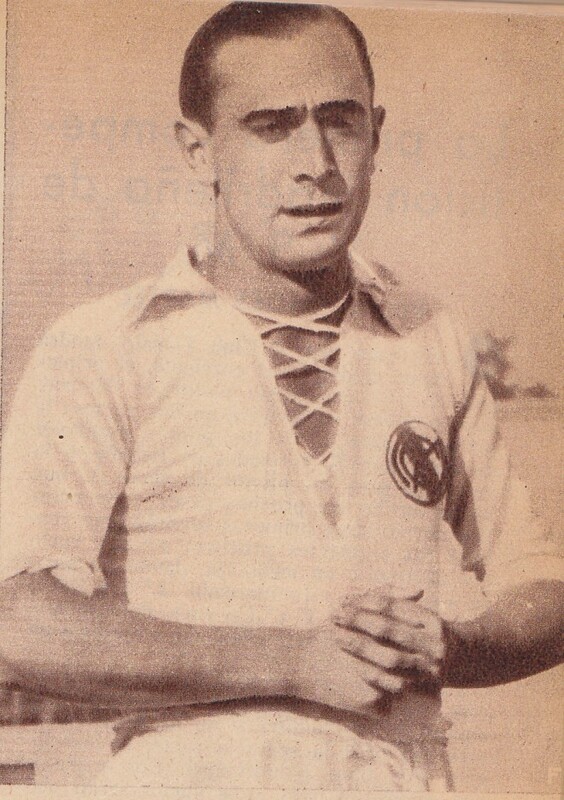 In 1936 younger brother Tomas is also at Real Madrid, although he didin't play any league matches. During the Civil War, Luis first goes north, playing for RC Paris. Then Tomas plays a few games at Girondins Bordeaux. It gets more exciting when both Luis and Pedro head off to Mexico to play in the league with the Basque national team, named Euskadi for this occasion. After that season, they stayed and together they won the league in 1939-40 with Asturias. In 1940 younger brother Tomas joins them. Luis didn’t make any headlines for his club Asturias and only a few for Real Espana in his last season, 1941-42. He became a coach, for clubteam America and for the Mexican national team. But Pedro (who inbetween also played for Moctezuma) and Tomas were the first Mexican professional champions in 1943-44 with their club Asturias. 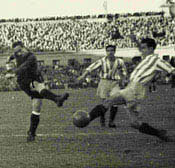 Larrinaga was the most important player of Real Santander in the first half of the thirties. He only played one match for Spain (3-0 to Portugal, one goal), but was of course part of the Basque team that travelled the world in 1937 and 1938. And, as half of his teammates, stayed in Mexico. At first he played for Asturias, but he changed to Real Espana in 1941. It proved to be the perfect ending of his career, with national league titles in 1942, 1944 and 1945. Only 18 years old in 1936, Zubieta had just played one season at the highest level in Spain. With Atletic Bilbao midfielder Zubieta played 21 matches and scored two goals. After the trip with the Basque national team Zubieta was contracted by Argentinian side San Lorenzo. Argentina at that time had one the best leagues in the world, but Zubieta stayed his ground and over the years became one of San Lorenzo’s most important players. He was still with them when San Lorenzo won the league in 1946. His thirteen seasons and 352 league matches at the club puts him in an alltime third position, after Sergio Villar and Roberto Telch. He returned to Spain in 1952, and added another four years at Deportivo La Coruna to his tally. Then, after twenty years of professional soccer, he calls it quits. Irargorri already had his fair share of titles in Spain, where he won the league title with Atletic Bilbao in 1930, 1931 and 1934. With him, Gorostiza and Bata, Bilbao at the time ad a tremendous attacking force. With seven caps Iraragorri wasn’t a regular in the Spanish team, but he did play at the World Cup 1934 – just like Luis Regueiro and the still to come no. 1 and 2 of this Top 10. At the end of the Civil War, Iraragorri – just like Angel Zubieta – started playing for San Lorenzo in Argentina. That didn’t work out, as he only played a total of five league matches for the blue and red, without scoring a goal. So he, as many others, turned his eyes at Mexico. 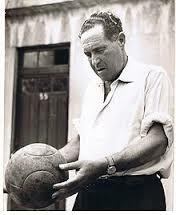 With Real Espana he won three championships and mostly got his own goalsco record into double figures. He eventually came back to Spain, played another three years for Atletic Bilbao and then started a coaching career. Ventolra (or Vantolra) was a household name in Spanish soccer prior to the Civil War. He played for two seasons at Espanyol, then spent three years in the second division with Sevilla. Then Barcelona picked him up, and the winger payed them back with 31 goals in three seasons. His biggest match without a doubt was Barcelona – Real Madrid on April 21, 1935. It ended 5-0 and Ventolra scored four of them. He also played twelve times for Spain (three goals). After Barcelona’s tour of Mexico in 1937 Ventolra decided to stay in Mexico City. He was taken on by Atlante and won the league in 1941 and 1947. 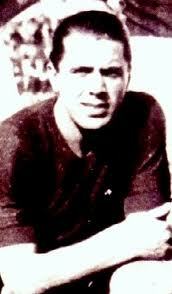 In 1941 he also was the leading goal scorer with 17 goals and was voted best player of the CONCACAF-region. 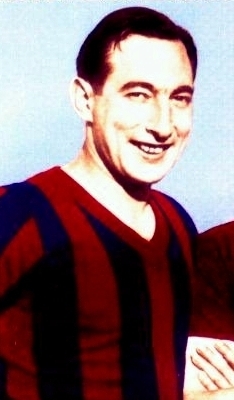 He played for Atlante until he was 43 years old, and still managed to score seven goals during his last season (1948-49). Powerfully built Langara – sometimes people would think he was a wrestler – had just one thing on his mind during his soccer career: scoring goals. With his physical strength and his canonball shot he was difficult to stop. At the start of his career, langara was banging in goals for Real Oviedo in the second division. With 24 goals in 18 matches Langara was vital in the promotion to first level in 1933. Real Oviedo went straight to the top, but never won the title. On a personal level, Langara did win a string of Pichichi’s (the trophy in Spain for the best league goal scorer during a season): 26 goals in 1933-34, 27 in 1934-35 and 28 in 1935-36. His average for the national team, 17 goals in just 12 matches, was even better. So, after a season in Mexico with Euskadi (17 goals in 8 matches! ), Angel Zubieta advised his club San Lorenzo to sign Langara. On the day of his arrival, San Lorenzo had to play River Plate and Langara scored all four goals in a 4-2 victory. In four seasons with the club Langara made no less than 106 goals, but it got him only one top scorer title (1940), which he had to share with Paraguyan Delfin Benitez Caceres from Racing Club. Five matches (with four goals) into the 1943 season with San Lorenzo, Langara moved back to Mexico, where the league had justed turned professional. Again, the figures for his club Real Espana are breathtaking: 28 goals in 1943-44, 38 in 1944-45 and 40 ( a Mexican record) in 1945-46. The 1945 national title with Real Espana was his only trophy at clublevel.